Motorcycle Product Review: Newfacelook Kevlar Riding Pants | I JUST WANT 2 RIDE!! I was in the market for a new pair of riding pants. I have one pair of Bilt “Iron Worker’s” Kevlar riding pants but camo is not something you can wear everywhere. I know that Kevlar/Aramid pants range from $300 and down, I was looking for something in the under $100 range. Scanning Amazon I ran across Newfacelook and their line of jeans and cargo pants. The price was right and the reviews were more favorable than not so I decided to give them a chance. I did notice that a lot of the reviews stated that the pants ran small so I ordered a size up. Boy those reviews were right, they run very small. I normally were 36 and I ordered 38s, my best guess is that these are closer to 32s… no way I was getting them on. I had no issues returning the pants. Even though they did not fit, they did look well made. I took a close look at the seams and how the Kevlar was attached to the pants, based on my impression of the build quality I decided to give them another chance. This time I ordered size 40 (wow) and they fit like a normal size 36, imagine that. I wore the pants on a bunch of local day rides and then during our 1700 mile motorcycle vacation. I like them, they have held up well in the heat and the rain. They are comfortable and I do not even notice the armor. I have not had a chance to try out the Kevlar and armor, thank God, but both seem to be of quality, not that I am an expert on either. I “FEEL” that I would have some protection if/when I go down. Now of course they are not perfect. A couple of the downsides, besides the sizing, they wrinkle to easy and the Velcro for the armor pouches gives me the impression that it might not hold up for the long run, I will have to wait to see on that. Without testing the protection I have to give the pants 4 out of 5 stars. For the price I really like them enough that I will likely buy another pair. Our dog Emmy points out the stitching. Great review! 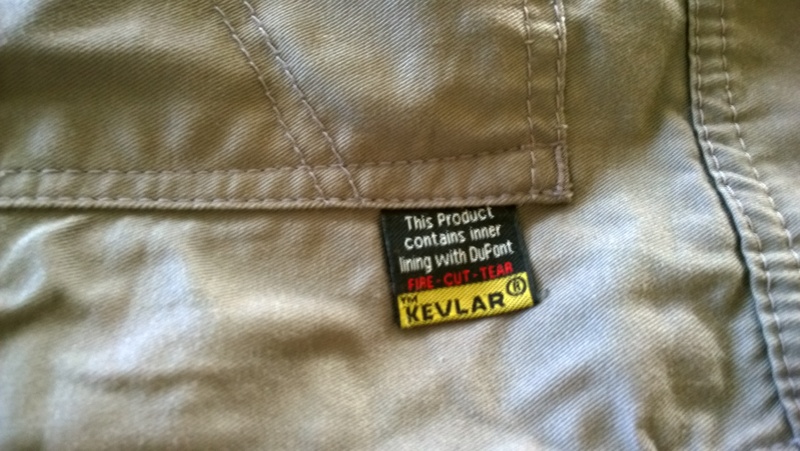 I’m a big believer in the Kevlar lined pants. I was wear a pair of Defenders from Diamond Gusset Jean Company when I laid my bike down in Death Valley and I had no injuries from the waist down and the jeans were tore up. I look forward to how the Bilt-Iron pants hold up. I have had the Bilt pants for about 2 years…. no idea about crash protection (and I hope I never do) but they are doing well for normal wear and tear. Thanks for the review, I’m one that doesn’t dress for the crash; although I know I should! Happy Trails and Smile somebody loves you! Most of the time neither am I. I am a cargo pants guy and all the Kevlar jean just look sad to me… even if they were protective. These pants, assuming they actually work, look like normal cargo pants I will likely order another pair in a different color. I liked them enough I just bought another pair. HOPE I never have to test them! I have an odd question, I was researching this brand and trying to find out where they were made. Is there any information on the tags (like made in China or made in the US)? I can’t seem to find anything on the company. Thanks! They are made in Pakistan. I tried to find a US made cargo pants but the Bilt in camo and black was all that I found. Nothing wrong with them just wanted different colors.